On Episode 138 of CrossFit Radio, host Justin Judkins interviewed CrossFitting insurance agent Vaughn Vernon. He also interviewed HQ’s man in the know about the Risk Retention Group: Dale Saran. Finally, Judkins spoke with HQ trainer, CrossFitter and Oly lifter Josh Everett. This episode was webcast live at 6 p.m. PDT on Wednesday, Sept. 22, 2010. 03:05 Vaughn Vernon is an independent insurance agent who came on the show to talk about the insurance needs of an affiliate owner. Vernon talked about different types of insurance and their costs and benefits. He cautioned owners and trainers to be aware of any exclusions in their existing policies and advised owners to join CrossFit’s Risk Retention Group (RRG). 20:50 Dale Saran is an HQ attorney helping with the RRG. 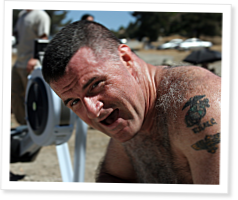 He appeared on the show to explain the nature of a risk retention group and how it can benefit its members, and he talked about the current status of the CrossFit RRG. Dale explained how the RRG is approved in all but three states and shared a few new and exciting things that are coming in the near future. 41:41 Josh Everett is on HQ’s certification staff and came on the show to talk about the Olympic Lifting Certification he conducts for Coach Mike Burgener. He also commented on the CrossFit-USAW Open that’s coming up in a little over a week. He gave his thoughts on the competition and explained how he has been training for the event. Everett also talked about the “Isabelle-off” in which he will compete against Dave Lipson to kick off the weekend. A three-time CrossFit Games competitor, Everett closed by explaining what his competitive future looks like in regards to the big show.